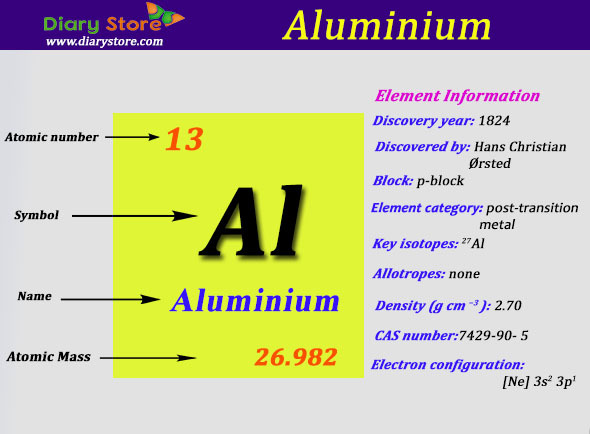 Aluminum is an element in the 13 th group and third period of periodic table. Its atomic Number is 13 and symbol is Al. Aluminum is a silvery-white, ductile metallic element. Though Aluminum is the third most abundant element after oxygen and silicon and the most abundant metal in the crust, it is never found free in nature. Al can found only in combination, chiefly in bauxite. 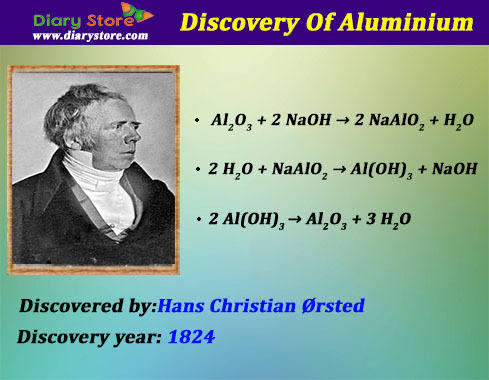 Natural Aluminum has 22 isotopes among which one is stable, 27Al. Because of its properties such as it has low density, is non-toxic, has a high thermal conductivity, has excellent corrosion resistance and can be easily cast, machined and formed and it is also non-magnetic and non-sparking so it is used in variety of products including cans, foils, kitchen utensils, window frames, Food and beverage containers and airplane parts. Aluminum and its alloys are important to the aerospace industry and important in transportation. Aluminum is a good electrical conductor and is often used in electrical transmission lines. Boron, Carbon, Nitrogen, Oxygen, Fluorine, Neon, Silicon, Phosphorus, Sulfur, Chlorine, Argon, Gallium, Germanium, Arsenic, Selenium, Bromine, Krypton, Indium, Tin, Antimony, Tellurium, Iodine, Xenon, Thallium, Lead, Bismuth, Polonium, Astatine, Radon, Nihonium, Flerovium, Moscovium, Livermorium, Tennessine and Oganesson are the same block elements. Boron, Gallium, Indium, Thallium and Nihonium are the same group elements. Hydrogen, Helium, LithiumBeryllium, Boron, Carbon, Nitrogen, Oxygen, Fluorine, Neon , Sodium, Magnesium, Aluminium, Silicon, Phosphorus, Sulfur, Chlorine, Argon, Potassium, Calcium, Scandium, Titanium, Vanadium, Chromium, Manganese, Iron, Cobalt, Nickel, Copper, Zinc, Gallium, Germanium, Arsenic, Selenium, Bromine, Krypton, Rubidium, Strontium, Yttrium, Zirconium, Niobium, Molybdenum, Technetium, Ruthenium, Rhodium, Palladium, Silver, Cadmium, Indium, Tin, Antimony, Tellurium, Iodine, Xenon, Caesium, Barium, Lanthanum, Cerium, Praseodymium, Neodymium, Promethium, Samarium, Europium, Gadolinium, Terbium, Dysprosium, Holmium, Erbium, Thulium, Ytterbium, Lutetium, Hafnium, Tantalum, Tungsten, Rhenium, Osmium, Iridium, Platinum, Gold, Mercury, Thallium, Lead, Bismuth, Polonium, Astatine, Radon, Francium, Radium, Actinium, Thorium, Protactinium, Uranium, Neptunium, Plutonium, Americium, Curium, Berkelium, Californium, Einsteinium, Fermium, Mendelevium, Nobelium, Lawrencium, Rutherfordium, Dubnium, Seaborgium, Bohrium, Hassium, Meitnerium, Darmstadtium, Roentgenium, Copernicium, Nihonium, Flerovium, Moscovium, Livermorium, Tennessine, Oganesson.